In 1916 Ernesto Jaboneta left Negros to join the US Navy. The only position then open to Filipinos was as mess steward aboard ship. He served on the battleship USS Connecticut for 3 years, until just after the end of World War I. When he was discharged, he decided to settle in the United States. There he met a young nurse, Ada Carson. The pair soon fell deeply in love, they planned an autumn wedding, but when Ada’s father learned of the romance he disinherited his daughter, banishing her from his household. Undaunted, the couple married in Hamburg, Pennsylvania, in October 1923. Ernesto had little trouble persuading his bride, divested by her father’s rejection, to return with him to the Philippines. The couple settled in Manila. And Ada Carson Jaboneta never saw or heard from his family. Ernesto Jr. was born in 1925. But tragedy descended upon the Jabonetas two years later when Ernesto Sr died after a long illness. Ada was left to support herself and her husband’s navy pension. They were able to stay on in Manila for a few years, taking advantage of the US Navy’s commissary and health facilities. But as costs in the city rose, she decided to move down to Negros, where Ernesto had been born and still had family. They found a home in Kabankalan, living a Spartan life. Ernesto Jr (Ernie to his mother) attended the local public schools, transferring to Silliman in his Junior year. 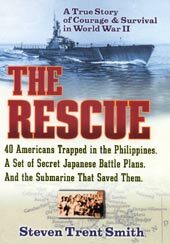 When the war broke in 1941 the Japoneta family was among the American citizen rescued in Negros by the Submarine USS Crevalle in a daring operation. The family was transferred to Brisbane, Australia. Few days later Jaboneta discovered that Australian friendliness toward Americans might not be universal. He and his pal James Smith (a refugee from Panay who had come down on Angler) decided to attend a dance at Caloundra Town Hall. The local lasses took quite a shine to the boys, much to the displeasure of the local lads. After Ernie and Jimmy took the girls for a few spins around the floor (to the latest swing tunes), the Australian boys confronted the two Americans. They persuaded Ernie and Jimmy that it might be best for all concerned if they left. Now. And they did, in the process learning something about the finer point of international relations. The next time a local dance came up the boys skipped it, instead preferring the company of two off-duty nurses, American nurses. The Jabonetas, Ada, Ernie Jr and Betty sailed for San Francisco. Ada had informally adapted Betty as an infant in 1937. The US immigration was not moved by the unusual way of escape from the Philippine and told Ada that Betty has to return to the Philippines. Ada and Betty returned to Negros in 1946. While sorting out all the papers, Ada received a message from Ernie requesting that she return to San Francisco to see her new grandson. Betty was left in custody of a relative who mistreated her. Her mother died in 1949 without bringing her back to the United States. Today, Elizabeth (Betty) is still working as “labandera” in Bacolod. Salvador Abcede had a lot of stake ensuring that Crevalle’s brief call was trouble-free. The aftermath of Narwhal’s previous had cause concern at GHQ in Brisbane about sending another submarine to Basay, Off Balatong Point on Feb 7 Narwhal had successfully unloaded a shipment of supplies badly needed by the guerrillas. She then evacuated dozen refugees, most of them civilians. But within hours the Japanese had learned, in detail, of her exploit. Five days later they launched a punitive expedition against Abcede’s district. The swept through villages, burning and looting as they went. They destroyed crops and livestock. The killed men and women, and children, too- 89 people in all. And then they left. Brisbane was dismayed by the breach of security. To overcome their apprehensions, Colonel Abcede had personally guaranteed the safety of this operation to General MacArthur. The Chief quarters, a small compartment abutting the wardroom, had been turned over to the ladies, including especially- the comely Modesta Hughes. There were 3 comely young women who the submarine sailors had been eyeing. Mothers with children slept alongside their kids on the decks of the forward torpedo room. The use of the toilet (head) created problem. The problem grew so serious and the complaints from the stewards, who had to clean up, so numerous that the Captain ordered his passengers not to attempt to flush the head on their own, but to let the crew do if for them.